A Polish hospital is using isothermal boxes fitted with NFC data loggers provided by French-Polish startup firm Blulog to measure and record the temperature of vital drugs as they are transported between laboratories and medical staff. 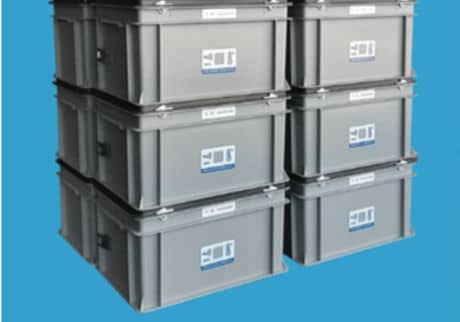 The Independent Clinical Public Hospital in Wrocław has been supplied with 20 boxes equipped with the NFC temperature trackers to transport cytotoxic drugs, which are only effective if kept between 2°C and 8°C. Blulog – a specialised startup in securing the cold chain – has supplied the data loggers, which can be read by doctors using an NFC reader or NFC-enabled smartphone, via the Bluconsole web application, or via email, where all information is securely stored and encrypted. Medical staff place drugs to be transported inside the containers. When the package arrives, it is verified by the medical staff. A coloured diode on the data logger indicates if the temperature inside the box has moved outside of the required range: red indicates that the transport’s parameters should be verified. “The most important factor here is simplicity of use,” says Professor Kazimierz Orzechowski from the hospital. “All we have to do is place the reader next to the box for a few seconds to read the data.